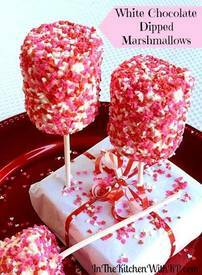 These jumbo marshmallows are perfect for putting on a stick. They are quite impressive in size when all covered in the sprinkles. I thought I may even make a few more to give as gifts for teachers. You can really mix up the sprinkles for any holiday you want. I am thinking green and white shamrocks for St. Patrick’s Day and pretty pastels for Easter would be great!